PURELY WONDERFUL! THE "MANOR" CAN NOW BE YOURS. RARELY AVAILABLE 4 BEDROOM PLUS DEN 3.5 BATHS PLUS A 3 CAR GARAGE. THIS SPECTACULAR HOME IS IN PERFECT CONDITION. FROM THE MOMENT YOU ENTER YOU KNOW YOU FOUND SOMETHING SPECIAL. 3200 S.F. UNDER AIR. MODERN WHITE KITCHEN WITH TOP STAINLESS APPLIANCES SUB ZERO REFRIGERATOR. MASTER WING WITH PRIVATE SITTING ROOM OFF MASTER. HIS AND HERS MASTER BATH. A HOME FILLED WITH NATURAL LIGHT. UNIQUE FLOOR PLAN THAT OPENS TO A CUSTOM POOL SURROUNDED BY A TUMBLED MARBLE PATIO. PERFECT HOME FOR ENTERTAINING RECENTLY OVER $100, 000 HAS BEEN SPENT IN UPGRADES. NEW ROOF. NEW 2 ZONE AC. WELL NESTLED WITHIN THE COMMUNITY. 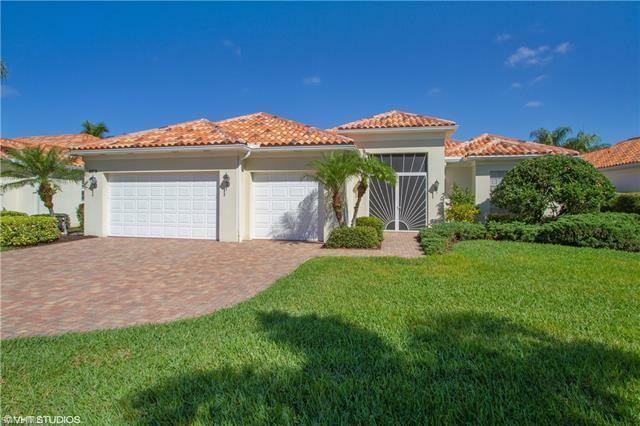 VILLAGE WALK IS A WONDERFUL COMMUNITY WEST OF I-75 NORTH NAPLES. A TRUE LIFESTYLE. HOA FEE INCLUDES HIGH SPEED INTERNET, CABLE AND PHONE MILES OF WALK WAYS AND CHARMING FOOT BRIDGES OVER 10+ LAKES. 3 POOLS, FITNESS, RESTAURANT, LAKES TO KAYAK ON , TENNIS, COMMUNITY ROOM AND MORE. WIRELESS CABLE AND PHONE PROVIDED IN HOA FEE SO ARE 3 VOUCHERS FOR THE COMMUNITY RESTAURANT YOU WILL LOVE IT HERE.